"This map is like awesome"
This map is like awesome. I suggest you download this, or you can wait because it will be in the Top5 mappack! It has lots of areas to hide and place spawns. It looks more like a futuristic warehouse but that's what Gloom is all about! It's made so that no one area can be used as an advantage, all areas are pretty equal, which is a good thing in terms of gameplay. Comment: Very good in design. Comment: Creative as in they did great with places for spawns and hiding and all sorts of stuff. This review has been read 1075 times. The Gloom Map Depository is copyright Team GMD. 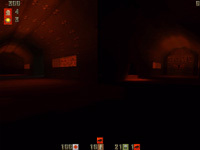 Quake2 is a registered trademark of Id Software. Gloom is copyright Team Reaction. The review script is copyright R1CH.